The view for Industry 4.0 in terms of inspection is to increase quality and maximise throughput, whilst reducing costs right down the production line, making your manufacturing processes faster and more accurate than ever before. In order for this to happen multi-sensor metrology alone is not enough to seize the maximum potential of your production line, instead integration of autonomous processes and hardware as well as complete connectivity is needed to fully embrace manufacturing of the future. 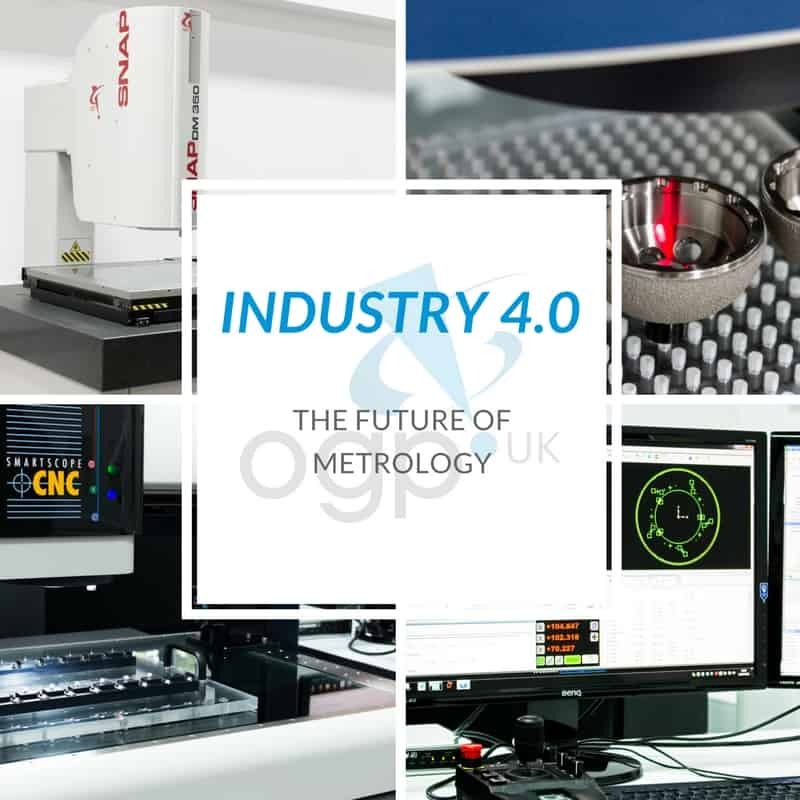 In order to move forward into Industry 4.0, manufacturers need to implement intelligent manufacturing practices with the following approaches and equipment, brought to you by OGP UK. Introducing automated part recognition, marking and robotic handling are all potential technologies to be integrated into present and future metrology processes and production systems, ensuring maximised throughput. Robotic loading and unloading of components will offer measuring machine integration within the production line and minimise errors through decreased manual transferring and handling. Connectivity between the measurement systems and the manufacturing machines will allow for autonomous adjustment of variant tolerances within the production, thus enhancing productivity by avoiding human error with the removal of operator intervention. This not only protects quality of your production line but also assures a higher level of reliability within these processes. Automated inspection will ultimately provide a flexible and connected solution to maximise your overall productivity. Revolutionary closed-loop technology is a complete manufacturing method in one, placing every step into a single system and delivering the ultimate production performance through the combination of expert knowledge, machining and metrology. Closed-loop technology is a process within the manufacturing machine that integrates both manufacturing and measurement operations, following inspection. Thus reducing costs and improving quality. This closed-loop is not only designed to automate quality assurance, it also raises the bar of machining accuracy to an entirely new level, ensuring your production line is of the highest possible standard. Allowing for measuring systems to communicate, request data and send it, as well as change and alter measurements using intuitive autonomous functions, such as adjustment of tolerance limits in pre-production, or the range of testing dependent on tolerance utilisation. Thus providing unlimited resources and communication for your machine to operate seamlessly and make changes dependent on data intelligence. Consisting of an inter-connected virtualised manufacturing cloud, or service pool of resources, intelligent management capabilities and services, cloud manufacturing provides solutions for every step of the manufacturing lifestyle. This enhanced connectivity ensures thoroughly optimised production processes at all times. Industry 4.0 is solely based on the exchange of information in order to maximise production efficiency, but in order to achieve intelligent manufacturing, you must implement means of continuous communication through full connectivity between processes, becoming a networked unit. Things like self-monitoring will be integrated into machine operational functions, including built-in sensors such as microphone chips to survey warehouses, heat sensors to moderate production temperature and many more. These components will have the ability to communicate and exchange data, making it possible for chipped machine equipment to disclose its own outage and initiate production as well as assembly of a replacement tool. For more information regarding advanced multi-sensor metrology solutions contact an industry expert at OGP UK where our engineers will be happy to assist you in all of your measurement needs and queries.